Sc2tog: Insert hook in next st, draw up a lp, (two lps on hk), insert hook in next st, draw up a lp (3 lps on hook), YO and draw through all 3 lps. R1: Ch9, sc in 2nd ch from hook. Sc in next 6chs. 5sc in last ch. Working on opposite side of foundation chain, sc in unworked lp of next 6 chs. 3sc in last ch (this makes 5 singles on that end). Join with sl st in first sc. R7: Ch1, turn. (Sc2tog) twice. Sc in 7 sts. (Sc2tog) twice. Sc in 7sts. Join with sl st.
R8: Ch1, turn. Sc in 2 sts. Ch3, sk 3 sts. Sc in next 2 sts. R9: Ch1, turn. Sl st in next 2 sts. 3sc in ch3 sp. Sl in last 2sts. FINISHING: Put the clasp on the key ring. Put key ring around the handle through the chain space. Put one ball of the hair elastic through the back center of the pouch and secure it like you normally do. Put retainer case and/or travel size toothbrush and toothpaste in the pouch, put the other elastic ball through the opposite side and secure it. 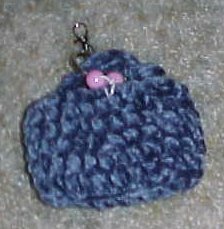 Hook it to your belt loop, purse handle or backpack.